The federal government is back in business this morning as an agreement was reached on a temporary spending bill late Monday. Iowa Senator Chuck Grassley says the next few weeks will be focused on finding a compromise on immigration. Grassley says it’s more than just DACA, the Deferred Action for Childhood Arrivals program, which was enacted during the Obama administration. Grassley, a Republican, makes it clear who he believes is to blame for the three-day closure of all nonessential federal offices and services, which took effect at midnight last Friday. “The government’s open, up and running,” Grassley says. “The Democrats shut it down and I think they lost ground for doing it. Maybe for that reason, it won’t happen again, at least in the near future.” Grassley says immigration isn’t the only issue that remains a sticking point between the parties. Grassley says, “More money for defense has broad bipartisan support, but there’s mostly Democrats that feel, ‘Well, if you spend one more dollar on defense, then we need to spend one more dollar on domestic programs. 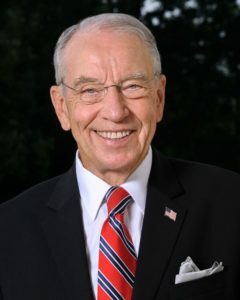 '” Grassley says defense is the number-one responsibility of the federal government, so he doesn’t “buy in” to the dollar-for-dollar argument.